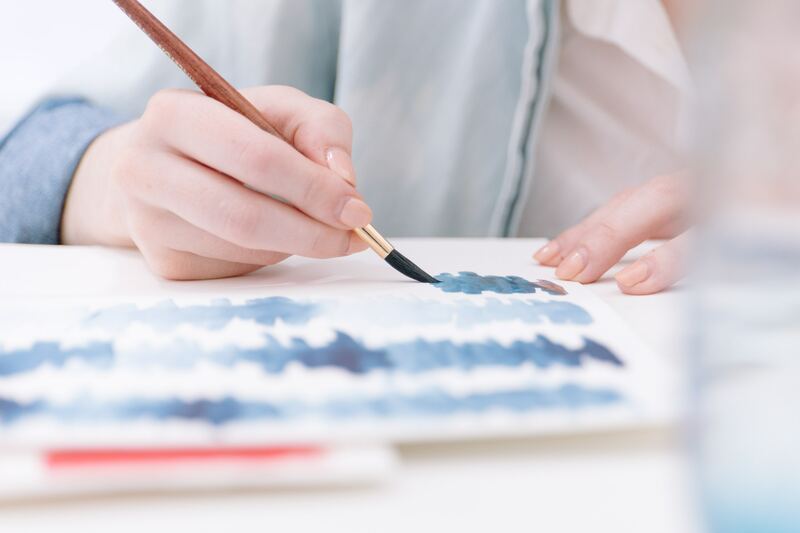 Watercolour painting is a method dating back thousands of years, and involves using paints that are made of pigments suspended in a water-based solution. It’s still widely used today because of the stunning effects that can be created with it. These watercolour techniques will help you improve your work, whether you’re brushing up on your painting skills or learning watercolour for the first time. A painter is only as good as their equipment, so it’s essential to have the right tools at your disposal. Choosing the correct brushes is important for achieving a range of effects. Brushes made with kolinsky sable hair are often recommended because they hold paint and water very well. Invest in various sizes and shapes so you can experiment with different techniques in your work and find the ones that work for you. Selecting the right paint is equally important, so ensure you buy a range of colours to work with. As watercolour paint is so thin, layering is a crucial skill to master. This method adds richness to your work and allows you to contrast opaque and translucent effects. Paint your first layer and allow it to dry completely before adding more layers. You can make layers with a single colour or multiple colours. Gradually apply more layers of colour on top until you’ve achieved a look you’re happy with. When it’s finished, you’ll be able to see the different hues overlapping, creating depth and realism. Creating texture can be tricky with watercolour paints, but it’s not impossible. One of the most common ways to add texture is by using salt. Simply sprinkle the salt over damp paint and allow it to absorb the pigments. When it’s almost dry, remove the salt by blowing or wiping it away. This leaves behind interesting spots and is a simple way to produce details like stars and snowflakes in your work. This effect occurs when wet paint spreads across damp paper, creating oddly shaped blotches. Blooming isn’t for everyone because it can look like a mistake, but it works particularly well in abstract paintings rather than intricately detailed pieces. You can achieve this effect by laying a colourful wash down on to your paper. Dip or swirl your brush in water, ensuring there’s a fair amount of water on it. Gently apply it to the colourful wash on your paper, and you’ll see the pigment being forced away, producing an array of strange shapes. Splattering is another technique that looks like a messy mistake upon first glance, but can actually enrich your work when used in the right context. It’s very hard to control and predict the results but it’s fun nonetheless. Make sure you cover your clothes and valuable belongings before attempting this method (you’ve been warned). Use a brush with stiff bristles and dip it into the colour of your choice. To splatter the paint across the paper, you can tap your paintbrush with another brush. This technique is better if you want to cover more area. Alternatively, you can achieve finer, more concentrated splashes by slowly running your finger across the bristles to splatter the paint onto your paper. Experimenting with wet and dry techniques is one of the most exciting (and challenging) things about working with watercolour. The wet-in-wet technique is one of the more difficult ones as you can’t predict the results and there’s less margin for error than other methods. This method involves applying pigment to wet paper, and it’s ideal to use cold pressed, rough paper so the water is absorbed faster. Sketch your drawing in pencil first so you can maintain some of the essential details. Start painting from the centre of the paper, gradually working your way outwards. If you want your shape to spread over a larger area, ensure your paper is shiny wet. For a more controlled shape, apply your paint to damp paper. Try to work quickly to see the most benefit from this technique, as the colours won’t bleed into one another as easily as your painting dries. Want to master more techniques? Check our tips on creating art using Roy Lichtenstein’s techniques and how to sketch.